Another great Open Mic at the Lilypad! Pokey Little Room performs "Long Time Gone"
Pokey Little Room performs "Beautiful Girl"
Rachael Harris performs "It's time"
We're looking forward to the next Kids Open Mic on Sunday, February 2nd! 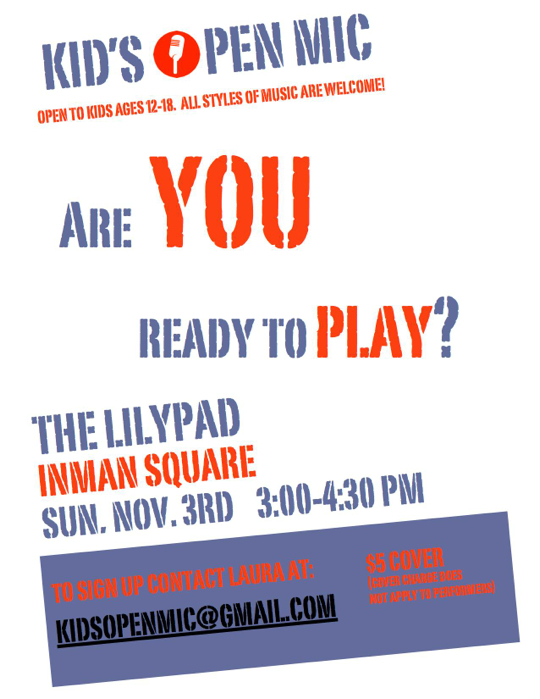 Please join us for the next Kids Open Mic on Sunday, November 3rd from 3-4:30 at the Lilypad in Inman Square, Cambridge. The event is open to kids ages 12-18 playing any style of music. We can accommodate solo performers as well as ensembles/bands. For more information or to sign up, contact us! Hello everyone! We are thrilled to be part of the Mystic River Celebration again this year. I have booked all the music for the event and I will be the EmCee as well. This year we have an incredible line up including Out with the Cat (4-part vocal harmony and guitar/pop and rock); The Larry Terry Project (blues/jazz/R & B); Susan Cattaneo (Americana); and Philip Hamilton (world/R & B). The festival is on Saturday, October 5th from noon to 4 pm at the Condon Shell located at 2501 Mystic Valley Parkway in Medford. The event is FREE and open to the public. Please join us! We invite you to join us on Thursday, Sept. 19th from 3-7 pm for the final Circle the Square event in Medford Square. This street festival features live music, artisans, children's activities, dance, and much more. The theme this month is "Around the World" and we are pleased to showcase some wonderful performers including Balla Kouyate (African drumming and singing), Rebecca Zama (Haitian singer/pianist), salsa dance with Dance Caliente, henna tattoo with Manisha, Rob Duquette (world percussion), the Lion Dance by Xtreme Ninja, parkour demonstrations, traditional Chinese dance with the Cambridge Center for Chinese Culture, Indian dance by Mouli Pal and Tufts Bhangra, Latin American music by Trio Amaranth and Black Sea Combo, story walk and cultural tables with the Medford Family Network and much, much more. Check out <www.circlethesquare.org> for updates and a complete schedule. Welcome to the brand new Medford Music Studio website! We are thrilled to share our love of teaching and music with you. Please check in frequently for updates about lessons, performances, events and other interesting tidbits. Thanks for stopping by!